There are many schools of Chinese wush (martial arts), all with technical skills based on philosophy. Since ancient times, many people have devoted their lifetime and energhy to probing the nature and essence of wush and mastering the maximum skills, but few have succeeded. However, a learner can improve his skill if he keeps on practising and someday he will become an expert. As the saying goes: Drops falling, if they fall constantly, will bore through a stone. 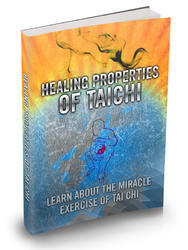 Taijiquan is a part of the rich cultural heritage of China. It is an art in whose slow and gentle movements are embodied vigour and force. As a Chinese saying aptly puts it, "Inside the cotton is hidden a needle". Its technical, physiological and mechanical qualities all have a philosophical basis. For learners, the guidance of a good teacher and discussions of the skills and techniques with friends are necessary, but the most important thing is persistent and untiring practice. Indeed, there is nothing like practice, and learners of taijiquan, men and women, young and old, will get the best possible results if they keep at it all the year round. In recent years, the number of people studying taijiquan in various parts of China has been increasing. This is an indication of the bright prospects of wushu. Many learners are conscientious and persistant in training, which will enable them to attain a high level of achievement. It should be pointed out that two wrong tendencies should be guarded against. The first is that some some people who are young and talented acquired a quicker understanding than most other people and so become complacent and stop half way. These people can never achieve great success. The second wrong tendency is that some learners are too anxious to achieve quick success and get instant benefits. They want to learn everything in a short time, from shadow boxing to wielding the sword, broadsword, spear and other weapons. They know a smattering of each, but do not grasp the essence and their movements and postures are full of flaws to the expert eye. It is difficult to correct their movements, for a thorough "overhaul" is needed and , as often as not, they might change in the morning and return to the old habits in the evening. Hence the saying in Chinese boxing circles: "Learning taijiquan is easy but to correct a wrong style is difficult". In other words, more haste less speed. And if these people pass on their mistakes to others, they will be doing a great harm. 1. Keep your head erect and do not incline it forward or backward. As the saying goes, "Its like there is something on your head, and you should take care not to let it fall". But you should not hold your head in a stiff manner, and though your eyes look straight ahead, they should follow the movements of the limbs and body. Although your eyes look into vacancy, they are an important component of the movements of the body as whole. Your mouth sghould remain half open and half closed, with the nose breathing in and mouth breathing out naturally. If saliva is produced in the mouth swallow it. 2. Hold the torso straight and the backoune and free end of the sacrum vertical. When moving, always keep the chest slightly inward and the back upright. The beginners should keep these key points in mind, otherwise their movements will become mere formality or dull-looking, and they will not be able to make much progress in spite of long years of practice. 3. Relax the joints of both arms, letting the shoulders droop and the elbows curve naturally; the palms should be slightly extended and the fingers slightly bent. Move the arms by conciousness and send qi (breath or vital energy) to the fingers. Remember these key points and success will be yours. 4. Take not of the difference in stance between the two legs which move as gently as those of a cat. When one foot is planted firmly on the ground,the other is in an empty stance. When you shift the weight on to the left leg, then the left foot is firmly on the ground, while the right foot is in an empty stance, and vice versa. though the foot is in an empty stance it is always ready to move. When the foot is firmly on the ground, it does not not mean that you should exert too much force on that leg, for if you do so, your body will incline forward and you will lose your balance. 5. The action of the feet is divided into kicking upward and kicking downward. When you kick upward, pay attention to your toes, and when you kick downward, pay attention to the sole; conciousness of the action will be followed by vital energy, and vital energy will be followed by strength. When you do all this, you should relax the joints and avoid stiffness. 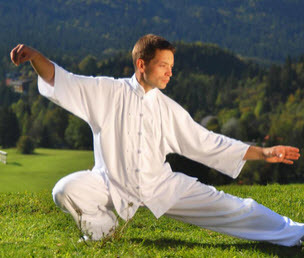 In practising taijiquan, one should first master and practise the "frame" as above mentioned (bare-handed forms), such as Taiji shadow boxing and changquan (long shadow boxing); then one can proceed to single-hand pushing, one-site pushing, pushing with feet moving and freehand fighting, and after a period one can take exercises with weapons such as taiji sword, taiji scimitar and taiji spear. Learners should practise regularly every morning or before going to bed. It is preferable to practise seven or eight times during the daytime; if one is hard pressed for time, then at least once in the morning and once in the evening. Do not practise immediately after meals or after drinking. The best place is in the gardens or parks where the air is fresh and the environment conducive to health. Do not practise on windy days or in a filthy place. For when you do exercise, you might breathe in too much dust or dirt which is harmful to your lungs. It is advisable to put on sportswear and comfortable cloth or rubber shoes. When you sweat, don't take off your clothes or wipe with cold towels, lest you catch cold and fall ill.